Florida might seem like the ideal location to be a dog owner. The sunny weather and the long stretches of beach are often great for running and playing with your furry pal. To ensure that your home and yard are also the ideal playgrounds for your dog, taking steps that promote its safety is essential. One of these steps can include the installation of an electric dog fence. Florida residents can use this pet fence to keep their dog within a safe, confined area of the yard or home. When it comes to the benefits of an electric fence, FL dog owners can count on great peace of mind knowing that their pet companion can’t go in off-limits areas. For instance, if you have precious garden plants or flowers that you want to keep intact, you can protect them by installing an electric fence around them. If your dog has a chasing fetish, the fence will prevent it from escaping the yard to chase after cars, animals, people, or other triggers. Another benefit of the hidden boundary is that it’s out of sight. Unlike a traditional garden fence, it doesn’t block the view, and it’s also less labor-intensive and more affordable to install. Our wireless dog fence can work on multiple dogs simultaneously, too. When you purchase Dog Guard’s wireless fence system, our fully trained technicians will install it for you. They will place a wire underground in the areas where you want to create boundaries. Your dog must wear one of our collars with a built-in receiver. A transmitter box will be in your possession and should be placed indoors so you can always monitor whether the fence is activated. If your dog is in the yard and goes within three to six feet of the underground wire, a noise or mild shock will be emitted to correct its behavior. If your dog continues to go toward the off-limits grounds, a slightly harsher correction will be given. You don’t have to worry about the corrections hurting your dog because they are fully tested, safe, and veterinarian-approved. To learn more about how our fences work and how they can benefit you and your pet, take a look around our website. After installation of an electric dog fence, Florida residents should focus on proper dog training. Our technicians will outline the installed boundary with small flags, which serve as visible markers for your dog. Use the flags to train your dog. When you notice it going near the flags, tell it “no” and redirect it to an area where it is allowed to play. Always reward your dog when it’s displaying desired behavior. Give it a treat and a lot of praise to motivate it to keep up the good work. Be consistent in your training. After about two weeks of daily training sessions, remove the flags. Your dog will most likely stay away from the area where the flags were. If curiosity gets the best of the dog and it ventures toward the boundary, you can always count on a correction from the wireless fence. FL dog owners will have more time to spend on other things besides watching their dog. Don’t get tempted by over-the-counter, do-it-yourself pet fences. When it comes to the safety of your dog, you need something that’s made with state-of-the-art electronics. 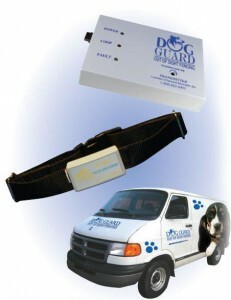 Our Dog Guard system comes with a limited lifetime warranty and a 100 percent money-back guarantee. Additionally, the receiver is waterproof and the correction that’s given can be reduced significantly. For installation of the hidden fence, FL dog owners should count on an average duration of five hours. Whether you have a dog who enjoys running, a stubborn dog, a mini-breed, or a medium-size dog, the wireless dog fence can keep it within the permitted area. We have different receivers that are geared toward the type of dog you have. Our transmitters are encoded and virtually unaffected by any interference. You won’t have to spend your time watching your dog because the hidden fence will do the work for you. Also, in the case of a power failure, the fence doesn’t have to lose its active state as long as you buy a battery backup. With the right boundary system and consistent training, you can have a well-behaved dog who can safely play inside and out.